If you own a business you understand how important time is and any time you experience delays it costs you money. 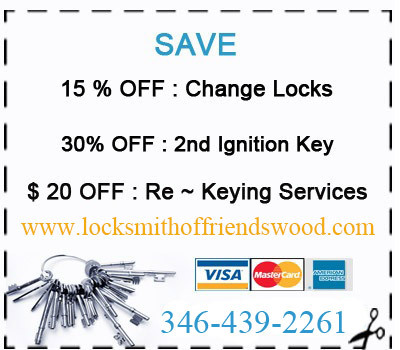 If have Broken Office Keys, for example, you could get locked out of your business unless a service like King Locksmith of Friendswood comes to help you. We can extract your damaged key from your lock quickly and if need be make another one for you. If you have lost keys to your building you could be wasting a lot of time that would be better spent working or servicing your customers if you have an office lockout. But if you call us at any time of the day or night, we will come quickly to unlock the door for you. We not only have the right tools for the job, we are open 24 hours a day, 7 days a week. In case you require help, you will not find a better service in Friendswood, Texas that is ready and available to help you as we do. Do you carry a big bundle of keys for the many doors in your business? Is every door in your office building opened with a different key? If you don’t have a Master key system you are wasting a lot of time looking for the right key, but we can help you by making one key that can help you open all your doors. Not only will this save you money, but it will make your operation smoother.